photo source AP/M. SPENCER GREENE Gov. 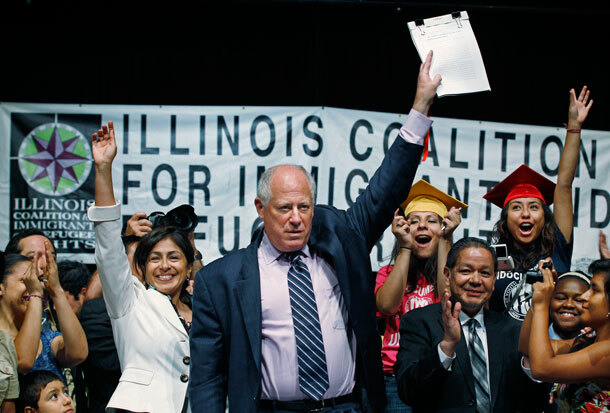 Pat Quinn celebrates with students and supporters after signing the Illinois DREAM Act into law on August 1, 2011. Illinois’s slow population growth over the last decade—3.3 percent, compared to a nationwide average of 9.7 percent—masks striking demographic changes in the state. While the white share of the population declined by 4.1 percent between 2000 and 2010, the state’s Hispanic, Asian American, Native American, Alaska Native, and mixed-race communities grew significantly. In 2010 Illinois had the fifth-largest Hispanic population in the country and the 10th-largest Hispanic share as a percent of the total population. In light of the state’s primary tomorrow, here are some facts about how the state’s growing communities of color are changing Illinois’s economy and electorate. 1. Communities of color—particularly Latinos—drive Illinois’s population growth. The surging Hispanic population in particular propelled the state’s population increase. In 2010 Hispanics represented 15.8 percent of the state’s population, a growth rate of 32 percent over the decade. Hispanic population growth alone accounted for 89.5 percentof the state’s total growth from 2000 to 2009. 2. Children of color now make up close to half of the children in Illinois. In 2008 Illinois was 1 of 20 states in the nation with a child population that was more than 40 percent minority. 3. Communities of color are younger and represent the future of the state. In 2010 the median age of non-Hispanic whites in the state was 41.6 years. By comparison, Hispanics’ median age was only 26.3 years, while the median age of African Americans was32.7 years and Asians 34.6 years. 4. The increase in Illinois’s communities of color will soon translate into political power. In 2008 there were 749,000 eligible Hispanic voters in Illinois—the sixth-largesteligible Hispanic voter population in the nation. In that year the state had the 10th-largestHispanic voting share nationwide, with Hispanics comprising 8 percent of the total eligible voter population in the state. In the 2010 elections 658,000 African Americans, 241,000Hispanics, and 88,000 Asians voted in Illinois, and there is room for these numbers to grow. The pressure to turn numbers into political power will rise along with the number of eligible voters of color in the state. 5. In 2008 the support of Illinois’s voters of color helped then-Sen. Barack Obama (D-IL) defeat Sen. John McCain (R-AZ) in the state. Even though Sen. McCain won 57 percent of white voters, Sen. Obama won the state with 61.8 percent of the total vote in 2008. More than 1 million voters of color cast their ballots in Illinois in 2008—more than 25 percent of all votes cast. Exit polls suggest that 95 percent of African American voters, 67 percent of Hispanic voters, and 62 percent of Asian voters supported Sen. Obama at the polls. 6. Illinois is a standout state in protecting its foreign-born population. On May 5, 2011, Gov. Pat Quinn (D) announced that Illinois would not participate in the controversial Secure Communities program (where immigrants booked into a county jail in a participating jurisdiction have their fingerprints shared with Immigration and Customs Enforcement), because of concerns that the program was being used to racially profile Latinos and resulting in the deportation of immigrants not convicted of serious crimes. This action spurred other states, such as Massachusetts and New York, to drop the program as well. 7. Illinois passed a DREAM Act and stopped an Arizona-style anti-immigration law. The Illinois DREAM Act creates a privately funded “DREAM Fund,” giving undocumented immigrants access to much-needed financial aid to afford college, and putting them one step closer to reaching the American Dream. On the flip side, Illinois State Rep. Randy Ramey’s (R) Arizona-styled bill H.B. 1969—filed in February 2011—has not been able to make it out of committee. 8. Families of color in Illinois face significant economic hurdles. In 2010 the median household income for African Americans in the state was $32,866—just above 55 percent of the household income for whites. The median household income for Hispanic residents in Illinois that year was 76 percent of non-Hispanic white income. 9. Unemployment hits these communities harder than any other. In 2010, 22.6 percent of the African American civilian labor force over the age of 16 in Illinois was unemployed. This level was 2.4 times as high as the comparable unemployment rate of whites (9.2 percent). Hispanic unemployment in 2010 was also high, at 13.2 percent. 10. Nevertheless, communities of color contribute significantly to the state’s economy. Unauthorized immigrants paid $500 million in state and local taxes in 2010. In 2009 the purchasing power of Illinois Latinos totaled $43.6 billion. The same year Asian American buying power totaled $23.8 billion. The 56,567 Latino-owned businesses in the state made more than $10 billion in sales in 2007, the last year for which data are available, while the state’s 59,367 Asian-owned businesses generated more than $18 billion in sales.